My thirty-five-year love-hate-love relationship with Phil Collins. Dafna Izenberg works as a magazine editor in Toronto. There’s a Genesis song called “Duchess” on the band’s 1980 LP Duke that could, in hindsight, be considered a cautionary tale for the man who sang it. It tells the story of a fledgling musician, fighting for her art. Times were good/She never thought about the future/She just did what she would. She stayed steadfast, worked hard, and one day her dream came true: The people discovered her; they came to listen; they cried for more. At first the artist basked in her success but over time she became a slave to it—second-guessing herself, trying to please others. And of course, the people could tell. They began to turn away from her. In place of adulation they began to show disdain. Eventually, all the artist was left with was a memory of her moment in the spotlight, what it felt like to have the audience cry You’re the one we’ve waited for. Phil Collins rode a similar pendulum. He spent the ’70s in relative obscurity, the man behind the kit in what was then a progressive rock band and something of a niche act. In 1981, he launched his solo career with the still-iconic “In the Air Tonight” and hit after hit followed, thirteen in the top ten by decade’s end. Collins was everywhere—guest-starring on Miami Vice, flying from London to Philadelphia to perform at both Live Aid concerts in a single day, producing the albums of Eric Clapton, and Howard Jones and Adam Ant. It’s been said that in the ’80s, he was second only to Michael Jackson in popularity. And then the ’90s dawned, and in much the same way that it did for the singer in “Duchess,” everything came crashing down. Phil Collins became a pariah, a punchline. He was mocked and ridiculed by other musicians, among them members of U2, David Bowie and the Gallagher brothers. He was held in contempt by diehard Genesis fans for turning the band into a veritable fluff machine. The one vouch he did receive was itself an indictment, coming as it did from Patrick Bateman, the fictional serial killer in Bret Easton Ellis’s novel American Psycho. In 1996, Phil Collins moved to Switzerland to live with Orianne Cevey, who is twenty-three years his junior, and whom he married in 1999. He continued to put out records—Dance Into the Light in ’96, Testify in 2002, Going Back in 2010—he toured Europe with a big band and he won an Oscar for the song “You’ll Be in My Heart” from the movie Tarzan. But his day was over. Having fallen outside the public’s graces, he soon slipped largely out its consciousness. Still, the odd tidbit made the news: in 2008, Collins’s third, and extremely expensive, divorce; in 2010, his apology for seeming so “cocky”; in 2011, revelations of drinking, depression and suicidality, as well as a formal announcement of retirement. And then, in 2015, the decision to come out of retirement, to re-release his solo catalogue, and to publish an autobiography, which came out this October. And that’s when a funny thing happened: People welcomed the news. Music critics scurried to put out articles tracing Phil Collins’s genius both as a drummer and a producer, falling over themselves to point out his role in cultivating the “gated reverb,” and wryly insisting that everyone, whether we choose to admit it or not, loves us a little bit of Phil Collins. A feeble attempt to revive the old vitriol—a jokey change.com petition to prohibit Collins’s comeback—was quickly shot down. It became abundantly clear that the pendulum had swung once more and the world was ready—clamouring, really—to celebrate Phil Collins again. My Phil Collins story begins in 1981, in a Sam the Record Man franchise in a northeastern suburb of Toronto, into which I had willed myself for the purpose of buying my first rock record. A boy in my Grade 6 class had been raving about Genesis’s new album Abacab for days on end while I was still listening to ABBA and the Carpenters, agitating to move on. But I was afraid of rock and roll, of its aggression and sexuality. I was sure that the cashier at Sam’s could see right through me that day as he took my money and rang in my purchase: Poser. Baby. Listening to the record at home that evening, I felt like neither. Rather, Abacab felt like me—cerebral and complex and convoluted, with songs about missed connections and sealed exits and alien abductions. The opening riff of the title track, with its buzzy synthesizers and call-and-answer guitar and keys, is imprinted in my mind, as is Phil Collins’s voice, breaking through like a fog lamp, making the weird, almost menacing, demand: Look up on the wall. It was the stamp in my passport to teenage-hood. When I started junior high the following year and all the cool kids had tickets to The Who’s farewell tour, I told myself I had my own thing going, that I belonged to perhaps a smaller but certainly a smarter tribe, and one just as legitimate. When I worked up the nerve to walk into the head shops downtown, I could find posters and pins and patches with Genesis logos alongside those of Led Zeppelin and Pink Floyd and Black Sabbath, and I could buy one without feeling like a fraud. Genesis was real rock and roll, and I was their real fan. This is the memory: An hour or so of downtime at summer camp, maybe ahead of a meal. Maybe the day was overcast, maybe it was even raining. Ten girls in a cabin in the woods, writing letters, trying on each other’s clothes, telling stories about people they knew back home. Me on my bottom bunk bed, listening to my Walkman, letting Hello, I Must Be Going run its course. Ruminating, as always, on my short haircut, my changing body, and the murky business of attracting boys’ attention. The music in the background to these churning worries. Until a disarmingly sweet phrase of piano music came in and then the plaintive voice of Phil Collins: You were lonely and you needed a friend/And he was there at the right time with the right smile. The song was a game-changer—a neurological game-changer. As in, it altered my grey matter, set off hundreds of thousands of synapses in my brain. It tells a simple story: husband neglects wife; wife finds solace in the arms of another man; husband beseeches wife to forgive him, to hold on to what they have. But for me it was full of revelations, about the complexities of grown-up love, about the dynamic nature of betrayal, and about the possibility of empathy—how a man, even at his most despondent, might own up to his failures. ’Cause I’ve been thinking and I know it was me/For leaving you lonely but hoping you could be strong. I knew boys to be silly and sweet, sometimes awful, mostly mysterious. Phil Collins wasn’t mysterious—he was sad. And he was sorry. He could see why his wife had strayed; he could see his part in it. As he sang her feelings, I became entangled in his: How would he recover from his broken heart? Who would help him get past the hurt? And of course I had an answer to that question: Me. I spent the rest of the summer in a Phil Collins–haze, floating between cabin and lake and dining hall, nursing my secret destiny. I no longer had to worry about all those pubescent boys around me, whether they thought I was funny or sweet or cool or smart; whether I thought they were. Phil Collins was my escape from that turmoil. He was my Heathcliff, my Rochester, my Rhett. Only not nearly so dashing, and thank goodness. Because who else would want him? Who else would even notice him? He didn’t gyrate like Jagger or bat his eyes like Simon Le Bon. On the other hand, it wasn’t like I’d fallen for some maudlin troubadour, like Barry Manilow or Michael Bolton. I wasn’t playing it that safe. Phil Collins, after all, was in Genesis. I fell in love with Phil, but Genesis was the impetus. Genesis was the prerequisite. There followed a year or two of quiet infatuation. I would watch City Limits, CityTV’s precursor to MuchMusic, for hours on Saturday evenings while babysitting, repeatedly dialling the program’s call-in number to request the videos for Genesis songs. I wanted to personally summon Phil to the screen, to commune with him in this way. I would gaze at the Genesis poster on my bedroom wall in which Phil wore a grey T-shirt, grey sweatpants and red-and-black striped terrycloth sweatbands on his wrists. I loved those sweatbands, the casualness of them, the indifference. Phil wouldn’t care about my pimples or braces or lack of popularity. He would see through to my soul. This would happen in a few years’ time, when I would make my way to England and somehow cross paths with him there. I took personal pride in his burgeoning résumé of collaborations—from ABBA’s Frida to Earth, Wind & Fire’s Philip Bailey—and felt utterly vindicated when he was invited to play drums on the multi-artist single “Do They Know It’s Christmas?” in December 1984. All the biggest stars were on that record—Bono and Bowie and Sting and Paul McCartney. Just look where Phil had got to! I marvelled to myself. How could the world help but appreciate him the same way I did! And that, of course, was the rub. In retrospect, I should have seen it coming. At a Bat Mitzvah party the previous spring, I had watched a group of girls from my grade stand in a circle on the dance floor belting out the lyric “Take a look at me now.” Come January, there was No Jacket Required, and then the single “Sussudio.” Sussudio. Has there ever been a more insipidly catchy, made-for-radio track in the history of pop music? The song has no story, no intrigue, no stakes—it just bleats out clichés about some girl the singer doesn’t even know. Everything rhymes. No human plays percussion. And what’s with that name? Is anybody in the world actually named Sussudio? (In fact, Phil made the word up while improvising the song’s vocals; when the time came to replace it, he couldn’t.) How could this song possibly have come from the same person who played in the world’s smartest rock band? Who gave the world “In the Air Tonight”? Who gave me “Don’t Let Him Steal Your Heart Away”? The truth is he wanted to be a star, probably from the very beginning, even though he often insists all he really aspired to in the early days was to play music and bring home a paycheque. I don’t think I even bought No Jacket Required. Instead I went deeper into Genesis’s back catalogue, back into the early ’70s when Peter Gabriel was still the band’s singer, before Phil took over, picking up records like Selling England by the Pound and The Lamb Lies Down on Broadway, and Foxtrot, of which nearly the entire second side is taken up by “Supper’s Ready,” a 23-minute opus with seven discrete sections, each absurdly named: “The Guaranteed Eternal Sanctuary Man,” for example, and “Ikhnaton and Itsacon and Their Band of Merry Men.” This was textbook prog-rock eccentricity, but I thought it was epic—Ulysses on vinyl—and revelled in all the Biblical references, the nods to mythology, philosophy, and literature. I kept that poster of Phil and his sweatbands on my wall, but I was starting to waver in my allegiance. “Old Genesis” just seemed so much more credible, so much smarter, so much more legitimate. And so much more available—the whole world didn’t know (or even care to know) “Supper’s Ready.” There was room for me to call it mine, something that was no longer true about Phil. In 1986, Genesis released Invisible Touch, their highest-charting and biggest-selling studio record ever. Now millions of people around the world called themselves Genesis fans, based on a grammatically sketchy song about some girl who reaches in and grabs right hold of your heart. I was appalled. The band I loved had fallen from the height of intellect and integrity to the gutter of the Top 40. After Genesis played at Toronto’s Exhibition Stadium that September, a boy in my grade laughed about all the people at the show who’d been calling out for “Sussudio.” Those plebes. I wanted no part of that. In my first year of university, I put up a poster of Gabriel performing “Supper’s Ready” on my dorm room wall. Then I moved on to the Pixies and Radiohead and Wilco. I never quite hated Phil the way the rest of the world did—he was too much like a hallowed old blanket. I simply blinkered myself to his very existence, amnesia’d him out of my mind. Until one day, when everything came crashing back. This happened many years later—almost thirty, in fact—on a weeknight two Decembers ago. I was on the sofa, settling into my winter malaise, and I flipped to some documentary about Genesis on television. The film was called Sum of the Parts, and it brought the five main members back together in the same room for the first time since the early ’80s. There were Peter Gabriel and keyboardist Tony Banks, sitting stiffly beside each other like a couple in counselling. There was Steve Hackett, virtuoso guitarist, met by a wall of uncomfortable silence as he described his need to break out of the band. There was founding member and guitarist Mike Rutherford, tall and skinny and mild as ever. And there was Phil, grinning, laughing, making goofy jokes, looking like the only one in the bunch with a little life left in him. Or maybe that’s how he always looked. Because here’s what I discovered: Phil wasn’t like the other members of Genesis. He didn’t go to Charterhouse, the posh boarding school where Gabriel, Rutherford, Banks and another friend, guitarist Anthony Phillips, all met and formed the band in the 1960s. He grew up middle-class in west London, went to theatre school as a teen, and had already been working as a professional musician for a few years by the time he joined Genesis in 1970. He was extremely ambitious but he wasalso very much the light touch in an intense, power-struggling and rather privileged group of young men. In old photos and videos clips, it’s Phil playing the clown, Phil making everyone laugh, Phil’s eyes crinkled up in a full-face smile while everyone else almost seems about to cry. It was “Don’t Let Him Steal Your Heart Away” 2.0. I dove deep into a further Phil-fact-finding mission, watching bootlegs of concerts and obscure radio interviews on YouTube, listening to all the old records. Certainly it was a way of getting through the winter. But it was so much more than that. It was like a section of my heart had lit up again, like I was carrying around a little beacon of refuge from the drudgery and disappointment of middle age. There were further epiphanies, the best of which was how important Phil was to old Genesis, the band I once blamed him for ruining. Here’s one anecdote I love: The sixth section of “Supper’s Ready” was written by Banks and Rutherford, with Rutherford setting the song’s unusual meter—9/8—on bass pedal and guitar, and Banks laying an intricate keyboard solo overtop it. Phil came into the studio, listened to the track once or twice, and then sat down at the kit and produced a riff that not only anchored the track’s stuttery time signature but actually made it groove. This seems to me a microcosm for Phil’s role in the band—at least in the early days—with the others always trying to push conventions and intellectualize the music, and Phil finding a way to make their affectations more sensual, less mechanical. Back then, you’d never have guessed that Phil might one day become the king of “dad rock.” There’s a photo of him circa 1976, bare-chested in a grey hoodie, long hair, full beard, red baseball cap, rolled-up jeans and blue-laced high-tops. He would also wear hockey sweaters—of the Leafs or the Habs or the now-defunct Minnesota North Stars—and dungarees, usually without a shirt underneath, often during concerts. I went back over and over footage of him performing “Supper’s Ready” in those dungarees, hunched over his snare, a gymnastic player, his limbs not flailing so much as reverberating, the cymbals thrumming, his eyes sometimes closed, sometimes wide open, completely engrossed. This, to me, is the very best version of Phil, better even than the one I fell in love with. This is Phil when he was still like the singer in “Duchess”—before he himself was even a singer—and before either of them became infected by fame. Only the stories aren’t exactly the same, are they? Whereas the Duchess character lost her musical integrity, Phil never did. He liked the pap. He liked “Sussudio.” He preferred Invisible Touch to Duke and Abacab and “Supper’s Ready” and the rest of the back catalogue. He may have been doing what the people wanted—what the record companies and the radio jockeys wanted—but he was also doing what he wanted. He wanted to shoot schmaltzy videos on misty balconies with white pianos surrounded by cast-iron globe lamps. He wanted to wear the kind of oversized suit jackets with shoulder pads and sheen finish that have come to symbolize the excess of the ’80s. He wanted his face on the cover of his records—all five of the first ones, in fact. The truth is he wanted to be a star, probably from the very beginning, even though he often insists all he really aspired to in the early days was to play music and bring home a paycheque. Not everything Phil says is true. I get that. For example, about his first divorce, Phil has always simpered as though he were the only victim, saying his ex-wife Andrea went off and left him in an empty house. Whereas Andrea’s version of things, laid out at length in Ray Coleman’s 1997 biography of Phil, casts him as selfish and insensitive, leaving her with their children for months at a time—once just days after their son, Simon, was born—when she begged him not to. Andrea’s version casts Phil as temperamental and at times quite controlling. And when I listen to “Don’t Let Him Steal Your Heart Away” now, I hear a trace of this—yes, Phil is trying to see his wife’s side of things, but he’s also telling her what to do: Don’t pack my suitcase, I’ll be back/Don’t take my pictures off the wall/You hear me? So maybe he wasn’t the man I thought he was. He wasn’t, it seems, the man several women thought he was. He cheated on his second wife, Jill, with an old theatre-school classmate, and ultimately left her for his new, much younger, love in Switzerland. After his third divorce, Phil became involved with Dana Tyler, a news anchor from New York, and then, earlier this year, revealed that he and his third ex-wife are back together and he couldn’t be happier. Tyler, meanwhile, went on hiatus from her job for several months following the breakup with Phil. None of this has been enough to turn me off. Perhaps there’s too much history. Perhaps there’s too much chemistry, the permanent imprint that a tangle of hormones and music might wreak on a developing brain. Or perhaps it’s just Phil. In the past year and a half, I have watched or listened to more than fifty interviews with him, taped as long ago as forty years and as recently as yesterday. And I find I’m just as captivated by the younger man, full of energy, friendly and open, but also caustic; by middle-aged Phil, with the same crinkly-eyed—but also more media-savvy—smile; and by current Phil, still full of beans, but softer now, more thoughtful. Here is Phil in 1981, trim and casual in a rugby shirt, nylon jacket and newsboy cap. He’s doing a radio interview in New York and he’s brimming with swagger over the soon-to-be-released Face Value. But he’s also nervous, clacking his chewing gum, raising his left eyebrow to drive home any point he thinks he might be challenged on, dropping names of artists he’s working with, resorting to impressions of Steve Martin when the questions become intimate. He’s on the brink of superstardom, but he’s still hustling, still insecure. He’s still my Phil. He really doesn’t see it like that. If he did, he’d never have had his career. The reason Phil Collins works, the reason he was able to sing I wish I could just make you turn around/Turn around and see me cry is because he doesn’t embarrass himself. It’s the rest of us he embarrasses, whether thanks to the desperation in his lyrics, or their triteness; whether it’s that temper that flares up when he’s criticized, or the ego that won’t let him say no when Hollywood or Disney comes calling; whether it’s his messy personal life or his refusal to be sorry for it—or for his success. Phil Collins got away with being greedy and petulant and selfish, impulses the rest of us have to fend off every single day. There is Phil, short, bald and slightly ridiculous, doing all the things we’re not supposed to do. Sit down, Phil, we want to say. Be quiet. As for his reconciliation with everyone else, well, I chalk that up to nostalgia. Yes, you despised “One More Night” when it first came out—like, really, really loathed it. But hearing it today has the power to put you back inside your teenage skin, back inside that earnest, visceral hatred which, at that time in your life, was really just another way of being excited for the future. Back inside a moment when your body was still new, the Earth still seemed clean, and your past was still too short to be checkered. If Phil can do that for you, surely all is forgiven. For me, the time-machine songs are mostly Genesis ones, and mostly from Duke. There’s “Duchess,” of course, and then there’s one called “Alone Tonight,” which practically puts me on the huge grassy field at summer camp, the sun above and the lake beyond and my whole life in front of me. A completely idyllic moment, and yet I cleaved to the song’s desolation: There’s nothing here, I can understand/And no one cares, I’m a lonely man. Banks was in charge and Rutherford was his deputy, but Phil was the heart of the band. They needed him, and somehow I did too. For a long time after the summer of “Don’t Let Him Steal Your Heart Away,” he haunted my romantic fantasies—either the boy was Phil, or he loved Phil, or he came to love Phil, thanks to me. But now I wonder if I was Phil, if my infatuation with him was really a wish to somehow embody him, to be able to be that effusive, that fallible, that free. I catch myself singing along to his records with such conviction—Tell me what else can I do but say I was wrong?—that I almost feel possessed, as if some unrealized version of myself is trying to waft up from within. 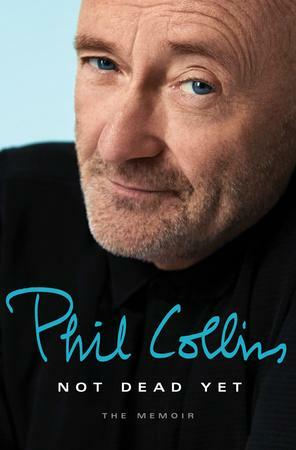 Phil Collins, once a lifeline to adulthood, has become, for me, a lifeline to childhood. Whereas I once rued the fact that everyone knew who he was, today am I grateful, because it means I can talk about him with anyone. When I was a kid, loving Phil was a secret; today, I want everyone to know, to shout it from the rooftops. This is what Phil would do—what he did do. Su-su-su-dio! Do you know what? I’ve even learned to love that song.